If you follow my blog then you know that part of my #Opfitbride has been listening to the Drop 2 Dress Sizes and more Slimpod for the last 7 weeks and i am amazed how it worked for me. You can read more about it on my Week 3 and Week 6 Updates. For your change to win this price all you have to do is fill out the Rafflecoppter form below! Please ensure that you fill out the form correctly only valid entrance can be counted for the draw. Please note: Joining the Slimpod mailing list and tweeting about the Competition is mandatory! 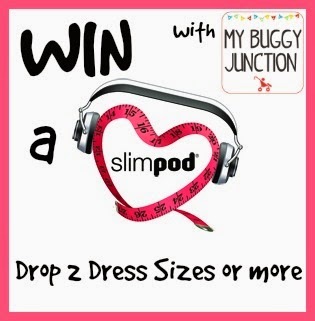 from my fellow Slimpod Blogger Buddies to win your very own Slimpod! Drop 2 dress sizes please!